Like a Lovecraftian god, Penny Arcade's quirky RPG series awakens from hibernation after years of slumber, and demands that you slay mimes and pirates. There are few things in life worse than a story that's been cut short. Don't take my word for it; just go to any pop culture forum and mention Firefly or Pushing Daisies to see what kind of reaction you get. When Penny Arcade, the mega-popular webcomic behind the PAX conventions, announced the cancellation of its half-completed game series, fans were pretty disappointed. On the Rain-Slick Precipice of Darkness, which deserves some kind of award for delightfully ridiculous videogame naming conventions, vanished from the downloadable scene after only two of its planned four episodes. Now, SNES-style RPG developer Zeboyd games will summon Precipice's third installment from the cold, ethereal abyss, continuing its offbeat, vulgar, and hilarious narrative. According to Bill Stiernberg and Robert Boyd of Zeboyd Games, the two indie developers got involved with Penny Arcade by pure chance. Fans on the Penny Arcade forums recommended Zeboyd as a possible successor to Hothead Games (developer of the first two Precipice games). Zeboyd expressed interest, but did not anticipate that the most popular gaming comic on the web would want a two-man indie developer to take on the enormous task of reviving its supernatural steampunk misadventure. 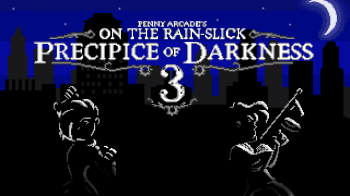 However, in 2010, Robert Khoo, Penny Arcade's business manager, contacted Stiernberg and Boyd, and invited them to work on the game. Since mid-2011, Zeboyd has pumped all of its resources into Precipice to prep it for a Summer 2012 release. The demo begins in familiar fashion at the Startling Developments Detective Agency. Here, 1920s steampunk analogues of comic protagonists Tycho Brahe and John Gabriel receive a mysterious phone call, wrought with Eldritch magic, and waste no time in setting off to discover the meaning behind it. After picking up Tycho's brilliant and headstrong niece, Anne, the three set off for the nearby pier, which has become infested with malicious mimes, pirate pelicans, and belligerent barbershop singers. Two huge changes from the previous entries manifest themselves almost immediately: the SNES-style graphics, and the lack of a customizable protagonist. By contrast, the first two Precipice games were 3D, semi-cel-shaded affairs that allowed a custom lady or gentleman to adventure along with the foul-mouthed Gabe and the erudite Tycho. 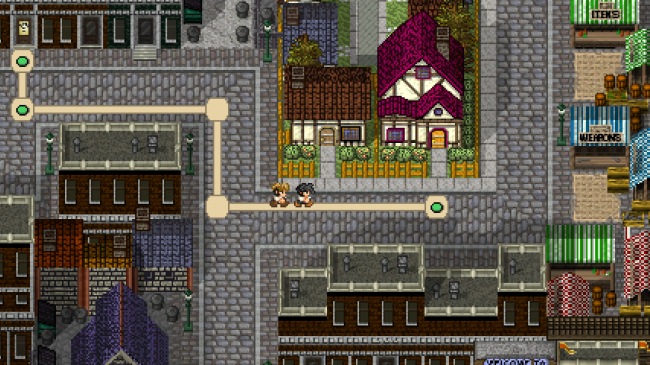 Regarding the graphics (which, Boyd remarks, have been aptly compared to Final Fantasy VI), Zeboyd has made a name for itself as an emulator of Japanese-style RPGs from that era. "Zeboyd has essentially mastered the Throwback RPG as an art form," said Jerry Holkins, Tycho's real-life alter-ego. "This isn't their first time to the rodeo. They are true rodeo enthusiasts. I forget what we were talking about." Boyd explains that Zeboyd has neither the funding nor the manpower to create 3D games, and that this art style is very much in line with the company's previous releases, Breath of Death VII and Cthulu Saves the World. As for the customizable protagonist who carried over from the first game to the second, his or her role as a playable character is finished. While Boyd would like to acknowledge the original protagonist in 3 "as an aside," he did not want to disrespect Hothead's contributions to the series. "It's better to say, 'Here's a new and interesting way to play,'" says Boyd. "[The fans] will be glad we didn't try to shoehorn old stuff in." Once the three adventurers arrive at the pier, the witty banter starts in earnest. Tycho can't get enough of big words and poetic syntax, whereas Gabe would rather cut right to the heart of the matter - preferably while cursing. While Anne reminds her uncle of his many near-misses in the world of Eldritch investigation, Gabe must constantly bite his tongue to avoid soiling the ears of his young charge. The dialogue is irreverent and often laugh-out-loud funny, which makes sense, considering that Zeboyd and Holkins shared writing duties for the game. 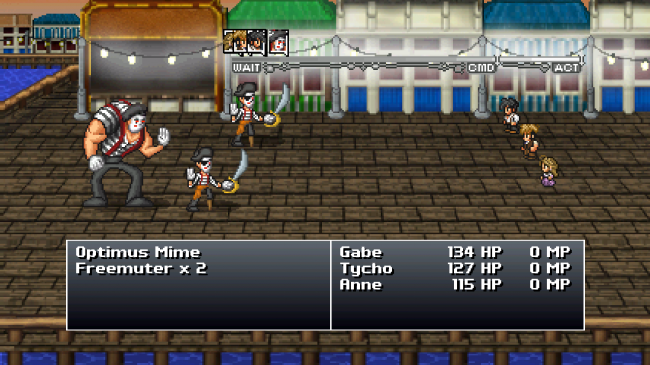 Once the fights with local piratical wildlife begin in earnest, the battle system provides a good mix of classic RPG turn-based combat and new ideas that help keep battles fast-paced and strategic. 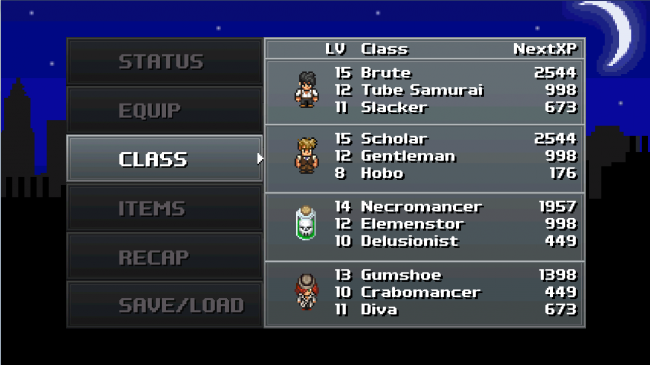 Tycho, Gabe, and Anne take turns duking it out with enemies, armed with tommy guns, gloves, and wrenches, respectively. 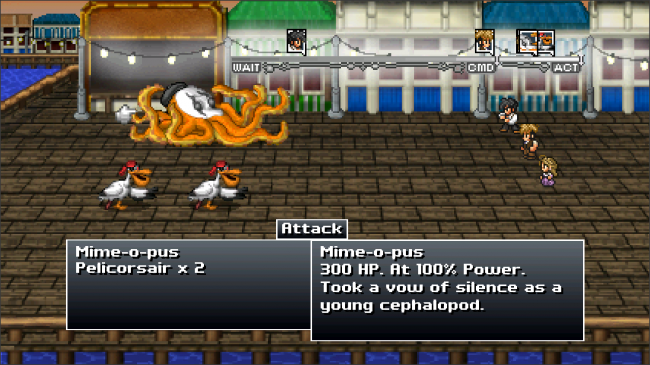 At the beginning of his or her turn, each character generates one magic point, which can be spent immediately or saved for a more powerful special attack. For example, 2 MP will allow Anne to use her "Nice Niece" ability, which heals the party, while Gabe and Tycho can hoard MP for offensive fire and ice spells. 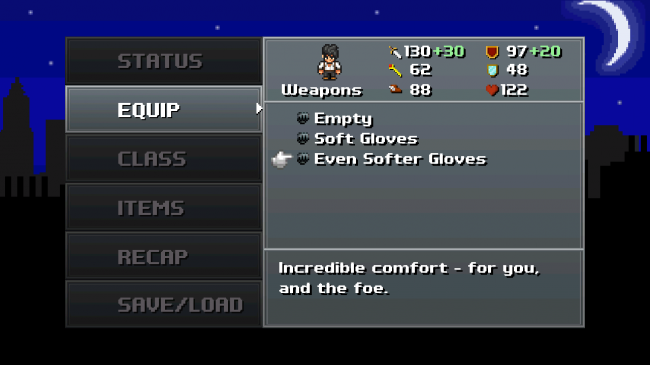 Since HP and healing items regenerate in-between battles, battles never get too difficult or unfair. However, MP also resets at the beginning of each fight, ensuring that the players will rarely start with a distinct advantage over the enemy. 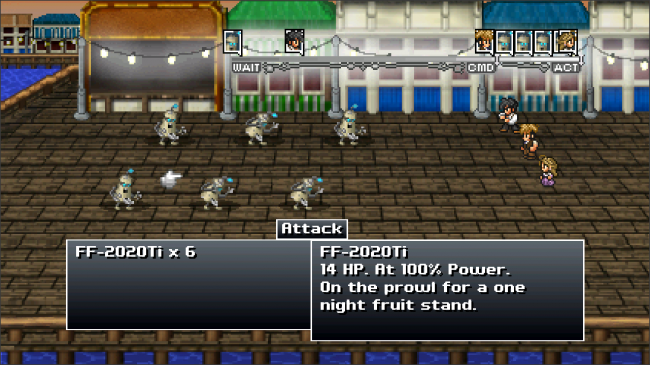 The party advances through the pier while encountering progressively tougher enemies, collecting treasure, and leveling up. When Tycho, Gabe, and Anne finally discover the pirate ship from which their foes sprang, they must do battle with none other than Karapyss, the Crabomancer. Rather than just using the monster as a throwaway joke, the Crabomancer actually presents a novel challenge: When hit with a physical attack, his physical defense increases dramatically. This requires players to strategically manage their MP and experiment with magic spells that may have gone unused up to this point. After the fight, the demo ends, giving only a brief teaser of things to come, including a brand new red-headed party member named Moira. For gamers with an affinity for Penny Arcade, 16-bit RPGs, or the first two Precipice games, there's very little - if anything - to dislike here. While the step down from 3D polygonal to 2D sprite graphics and the loss of a customized protagonist do sting a bit, the attractive art style, the strong writing, and the nuanced gameplay make a very compelling case to give the game a shot. Look for it this summer on PC, Mac, iOS, Android, and Xbox Live Indie Games.